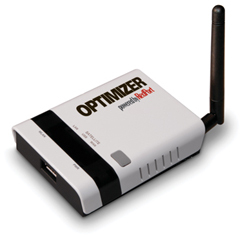 The Optimizer is a satellite Wi-Fi router, hotspot and firewall. 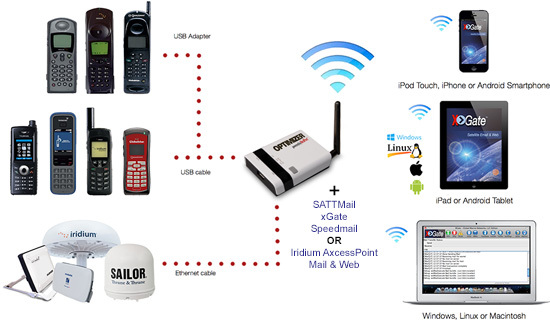 The Optimizer connects directly to your satellite phone or terminal and broadcasts a Wi-Fi signal that you can then connect to with your computer, laptop, smartphone, or tablet. Thanks to its powerful firewall, the Optimizer can also help to avoid huge and unexpected satellite airtime bills. OFFER! Activation fee is waived and receive 3 FREE months of SATTMail / XGate service (a $90 value) with your purchase of the Optimizer! Firewall stops all unwanted data traffic. WiFi signal makes setup and use with compatible computers and tablets easy. Track GPS locations from GPS-enabled satellite devices. Works with virtually all satellite phones and data terminals. SATTMail service subscription is required to use the Optimizer. (Also works with XGate and Speedmail). The following options are available and can be selected at the time of purchase. OFFER! $59 activation fee is waived if purchased with the Optimizer.